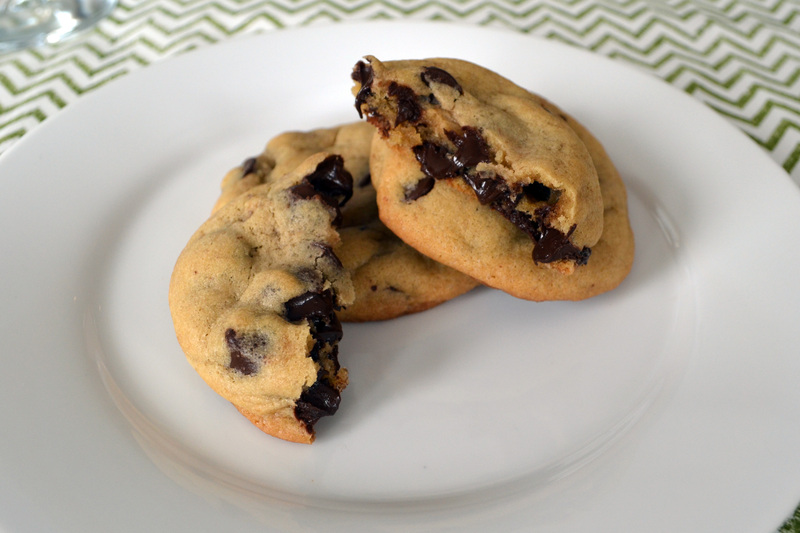 This recipe for chocolate chip cookies is one I have loved trying to perfect over and over again. Now that I’ve found it, I don’t dare mess with perfection. It is my most requested cookie by family and friends. I have found a no fail method for resulting in the most rich, gooey and moist cookie every time. Sometimes the most simple things in life can be the greatest. When it comes to cookies, classic chocolate chip is loved by all. Its all in the timing!!! I bake my cookies at 375F for nine minutes. Then immediately after removing from the oven I turn on my overhead range fan. This allows the cookie to cool quickly so that you can remove them from the pan faster. This step is important because the longer that cookie sits on a hot pan it continues to cook. Now you have the perfect cookie, firm but soft outside with a warm chocolaty gooey center! Serve warm cookies with cold glass of milk! Everyone knows how cookies can easily turn out wrong and you don’t know what happened. Thanks for sharing your tips. Now we can all achieve prefection.